A sense of community is palpable in the Dundee-Memorial Park neighborhood, where residents and merchants have sought National Register status, funded a streetscape plan, restored historic street lamps, and pushed to be declared a neighborhood conservation and enhancement district. A mix of uses, from quaint shops and restaurants to lovely early 20th century homes and inviting parks, infuses the neighborhood with vitality. The neighborhood is bounded by Western Avenue and Hamilton Street to the north; North and South 48th Street to the east; Howard and Leavenworth Streets to the south; and South Happy Hollow Boulevard, North 61st Street, Parkwood Lane and North 60th Street to the west. Single-family homes on tree-lined lots run the gamut from modest to extravagant in Dundee-Memorial Park. Period Revival architecture, especially Colonial, Georgian, and Tudor, is popular. Photo Lynn Meyer, Omaha Planning Department. Dating back 140 years, Dundee-Memorial Park has retained its charm and much of its historic architecture while accommodating new development. Its proximity to educational institutions and a major medical center add to its character. Omaha's first street-car suburb, Dundee attracted upscale homes through developer covenants that required a specified minimum investment in the neighborhood's houses. 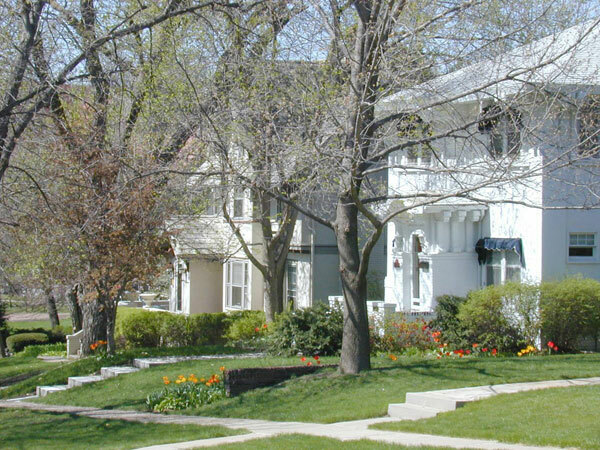 The area also benefited from recommendations and suggestions of noted landscape architect Horace Cleveland, who developed an 1889 parks and boulevard plan for Omaha that included Happy Hollow Boulevard, the neighborhood's western border. Other special features of the neighborhood include Memorial and Elmwood parks and two shopping corridors, one of which — at the southwest corner of 50th and Underwood — draws residents from all over Omaha. Original downtown Dundee features historic commercial structures and unique shopping and dining experiences. 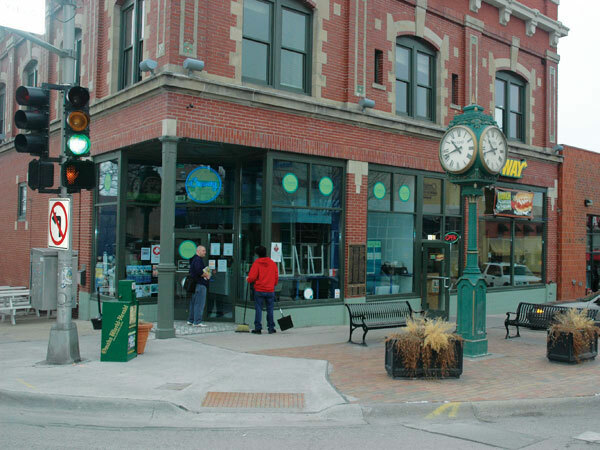 In 1997, local merchants installed benches, planters, trees, and this four-sided chiming street clock. Photo Dennis Johnson, American Planning Association. 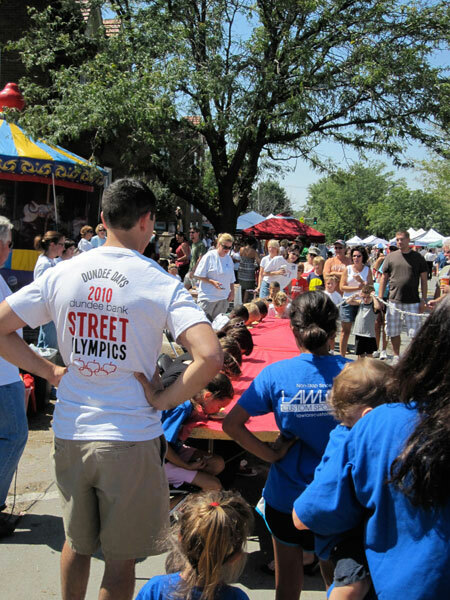 Dundee Day, an annual street festival in the neighborhood, is among numerous events that residents plan, administer, and staff. Photo Rachel Nuncio Gabb.